Assuming this pattern continues infinitely, what is the sum of the first one hundred terms? Define . Which function is equal to ? Each of the four tables below defines a relationship between (domain) and (range). One of these tables does not define a function. Identified the table. 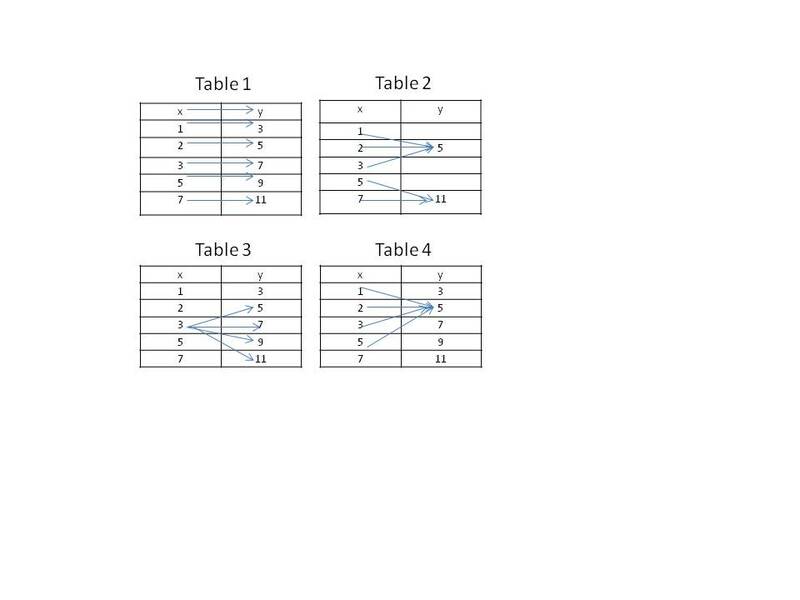 In table 3 we see an value of 3 gets tranformed into 5, 7, 9 ,and 11 which is not possible for a function. Hence the relationship between and in Table 3 does not define a function. Only in set A one can see that there is an unique value of for each value of and similarly each of the values maps into one and only one value. Hence set A must define a one-to-one function. Which of the following equations does not represent a function? The fact that each value of gives us two values of disqualifies it as a function. Only equation B maps each value of into a unique value of and in a similar way each and every value of maps into one and only one value of . Test whether the given function is symmetric with respect to the -axis, -axis, origin. Hence it is not symmetric with respect to the origin. which is not a function, since the -coordinate 5 is paired with two -coordinates, 1 and 5.